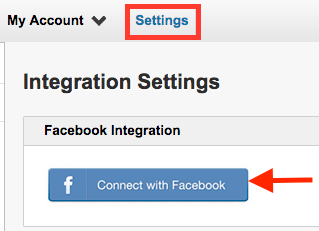 Integrating with your Facebook account is very simple. Visit the Settings page located on top of the navigation bar. Then, click on the Connect with Facebook button. You will have a new window pop-up from Facebook to login to your Facebook account. If you are already logged in to your account on your computer, you will be prompt a consent of allowing LeadsTunnel to access to your Facebook Advertising Business Page information. You will need to click on the Allow button from Facebook. In order to retrieve data from your Facebook Advertising Business Page, the Facebook account that you've choose to synchronize with Leads Tunnel must be an administrator of the Facebook Advertising Business Page. Once your integration is successful, you will see the following message in green: Integration with [Name] completed. To logout of your current Facebook account and disable synchronization, simply click on the blue Logout of Facebook link. Please Note Leads Tunnel can only integrate and actively transfer leads from one Facebook account at a time. If you have more than one Facebook account, you would need to have more than one account with LeadsTunnel.